Mediaplanet’s “Women in STEM” campaign helps shed light on the individual stories, successes and struggles of women and minority groups in STEM careers in the U.S.
Mediaplanet today announces distribution of its second cross-platform edition of “Women in STEM,” aiming to celebrate the growth of diversity in these fields while also looking at the many issues women in this industry still face. 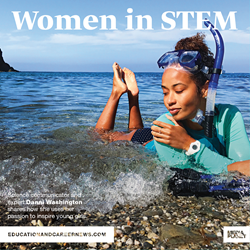 The print component of “Women in STEM” is distributed to a very key audience at focused STEM events, conferences, networking centers and universities, as well as a large network of K-12 public schools and learning centers. The digital component is distributed nationally through Mediaplanet’s Education and Career News content hub, social-influencer sharing and targeted STEM newsletters and news sites. This campaign was made possible with the support of DK Publishing, STEMconnector®, Canvas by Instructure, Chevron, Dylan Dreyer, Stephanie Abrams, Ginger Zee, Project Lead the Way, USA Science and Engineering Festival, NAF, Million Women Mentors, ACORD, Danni Washington, Texthelp, the School Superintendent Association, National PTA, National Geographic, School Outfitters, Latinas in STEM, Women in Technology Institute, Zume Pizza’s Julia Collins, Milken Award Winner Aja Brown, National Girls Collaborative Project, American Academy of University Women, Women in Manufacturing and more!